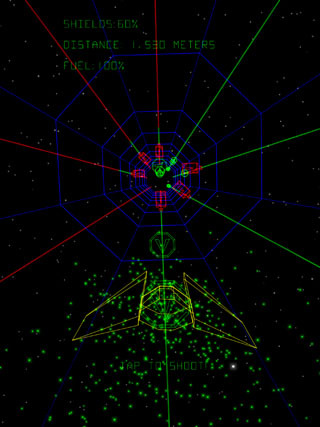 Beam Rider Retro: This is like Vector graphics in an Atari jacked up on steroids. Check this game and watch as all the three star, mass gaming points malarkey is injected into it. Considering it was made in 2 weeks by a pro developer – it’s a fantastic job. As with all great space ships, Beam Rider has a beautiful hull which would never go through a planet atmosphere but it is fully optimised for flying through the tunnels in space. Interestingly enough, the tunnels in this game are always straight and conveniently have green lines on them to identify which parts are safe. The aim of the game is to survive as long as possible without traversing any of the red areas, otherwise your shields are depleted and eventually you die. A quick swipe of the finger left and right lets you switch between lanes and a slash upwards lets you “jump” (Don’t question the ingenuity here – it’s just a game, so jumping in no gravity environments is allowed.) Full control is provided, so once you’re in the air you can switch to whichever lane you want and you can even force a fast landing. To top this all off you have a gun which you shoot by a mere tap of the screen… this does mean you shoot prematurely occasionally, but it just adds to the cool factor. I have to admit that I am a bit peculiar and when I see green lines and get reminded of Cathode Ray Tube screens used in Oscilloscopes, I get warm fuzzy memories of my past. 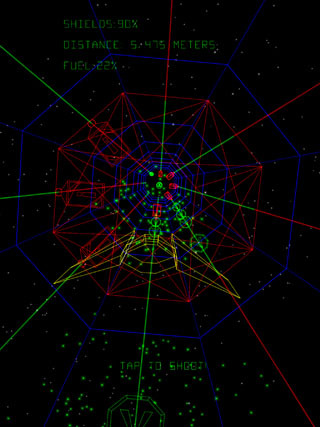 The same green lines in this game trigger nostalgic feelings deep in my heart. This game is just full of these luminescent green babies and they’re accompanied by blue which forms the tunnel, the danger red shield absorbers and orange ballistic enemies. Admittedly not everything old is great, and thankfully they’ve done away with the midi and replaced it with very uber space age club music (…a perfect track for getting you ready for a night of non stop dancing mayhem). Honestly though, the game actually needs the music because otherwise you lose the soul of it. Enough of my fantasising and ranting, what is the low down on the game? Well its enough to keep you occupied for a few minutes and its good for those short train journeys. The difficulty makes it a bit more for the seasoned runner players. At the moment it is pure gaming on a core engine which doesn’t have all the extras added in yet. Depth of view is a bit an issue, but that would surely come about with some more game refinement. Ultimately there are two ways of seeing this game. 1) you’re a fast gamer who only cares about seeing finished products and so you won’t really like this game or 2) you can see a real game develop, morph and grow. I recommend the pessimists out there to put their harsh words aside, and I suggest the optimists check this game and watch as all the three star, mass gaming points malarkey is injected into it. Considering it was made in 2 weeks by a pro developer – it’s a fantastic job.